The Corn Fed Spartans team are really onto something in the obstacle course racing world. 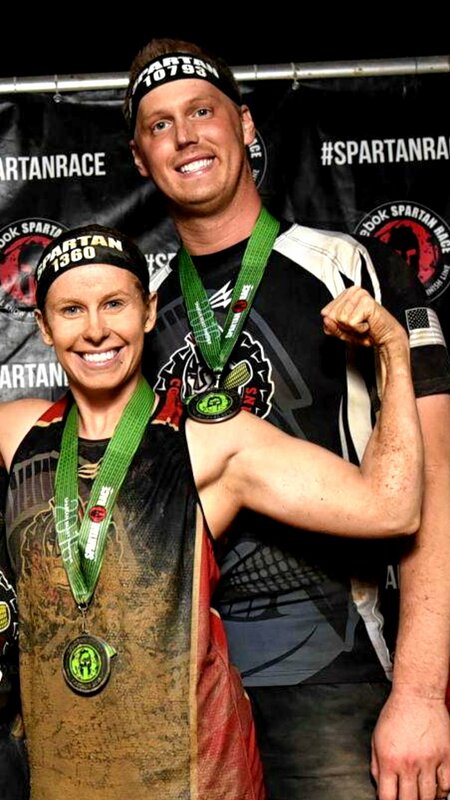 My first article about this Spartan Race group with nearly 5,000 members was about Josh Saunders, who lost 100 pounds training for Spartan Race then, I had the honor to speak with the Guardian Heat captain Cliff Cunningham. Coincidentally, it’s Cunningham who played a large part in our next Spartan’s decision to go Corn Fed: Brian Yensho II. A NASM-certified personal trainer, PharmD (doctorate in Pharmacy) student at Butler University and Pharmacy Intern, Yensho ran 15 half-marathons, 10 5K races, and seven obstacle races in 2016. All that running resulted in significant weight loss. Brian demonstrating a flagpole on a tree, probably made easier due to his gymnastics background. A resident of Indianapolis, IN, Yensho was captain of his high school gymnastics team, was a member of the Gymnastics Club Team at Indiana University (where he earned two Bachelor’s Degrees), became a licensed USA Swimming and Diving Coach and was a Lifeguard Instructor for the American Red Cross at IU. Yensho’s entrance into running started at that December 2015 half-marathon, where he met first encountered people wearing Corn Fed Spartans merchandise. Not surprisingly, most people who do OCRs have running backgrounds or start to run more often once they’ve done a few OCRs. In the case of Corn Fed, the members do local running races as a team. Cunningham ensured Yensho that he could complete a Spartan Race and that he would personally ensure Yensho crossed the finish line. Yensho wound up joining Corn Fed Spartans in July 2016 and started becoming very active within the organization. “It made races more fun and I learned a bunch of different ways to train that you wouldn’t have gotten by yourself,” Yensho adds. Yensho’s first-ever OCR was the Indiana Sprint in July at Perfect Slopes in Lawrenceburg, IN and he describes the experience as “brutal,” especially since he did minimal training or preparation for the event. After experiencing the physical demands of a mountainous Spartan Race course, Yensho decided to incorporate more gym training into his routine. He typically runs outdoors 3-5 times per week for cardio. Weather isn’t factor since he loves the cold and would prefer winter races over summer ones. For strength training, Yensho trains upper body twice a week and a legs once a week, doing barbell squats, lunges, thrusters and more. He favors a circuit training style since it’s efficient and allows for a variety of moves to be performed in a short amount of time. Although he’s most active in the Corn Fed Spartans team, Yensho also joined other major Spartan Race teams’ Facebook groups, including New England Spahtens and Southern Spartans. This came in handy when he decided to sign up for the Boston Spartan Super in August. Hearing Yensho explain just how easy it was to secure lodging for out-of-state races is encouraging to this race alone, get a hotel room to myself OCR traveler. Yensho says the mere volume of races he did in 2016 led him to seek less expensive ways of traveling. Becoming an active member of Corn Fed Spartans has led Yensho to lean heavier on OCR in 2017. After running that first half-marathon in December 2015, Yensho registered for the NASM-CPT exam to learn how to become a better athlete and train properly. And although he has clients, his work and school commitments limit him to 2-3 clients at a time. Even with a packed schedule, Yensho is drawn to completing Spartan Race’s educational material. Specifically, he completed the Spartan X Course in October 2016, a 10-module online course designed to help people achieve success using their minds. Yensho is preparing to take the Spartan SGX Course, Spartan Obstacle Specialist Course and the Spartan Edge Course. There is undoubtedly that feeling of unknown prior to your first OCR. What if I get gassed too soon? What if I can’t do an obstacle? Once you cross the finish line after a 3-5 mile OCR, it becomes clear that literally the majority of people can complete the course, even if they walk it. Yensho agrees with this sentiment that OCR is for most people. Yensho’s story is an example of how quickly one Spartan Race can turn into a commitment to living the proverbial Spartan life on and outside of the course. It’s also a testament to the outreach and marketing capability that Corn Fed Spartans has. Last, Yensho represents the “guy who’s just looking for a place to crash on Friday for the Saturday morning race.” And there lies the true appeal of OCR: making friends will lead to traveling the country (and world) for cheaper and with way more fun than if you were to do it alone.